Established in 1875, the Larkin Company was a national mail-order business that sold soap products to middle class consumers. Its managers, including John D. Larkin, Elbert Hubbard, Darwin Martin, and William Heath ascribed to the belief that hard work was a moral imperative, and attempted to foster a familial office culture. The construction of a new headquarters was intended to ensure the highest levels of efficiency, productivity, and cooperation among its employees. The mottoes adorning the structure’s balconies and exterior plaques, written primarily by Heath, reinforced these ideals. 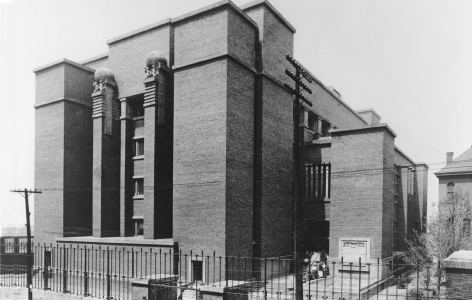 The structure’s plan, interior and exterior design, and furnishings responded to the daily operations of the company and provided for the welfare of its employees—an early form of air conditioning cooled the space while a communal dining facility, classrooms, and lounge area with a fireplace promoted a congenial office culture.